Earlier this year Encyclopaedia Britannica ceased publication of its print edition which was first published in Edinburgh in 1768. Last month Bertelsmann and Pearson announced the merger of their respective subsidiaries, Random House and Penguin. Around the same time, Newsweek announced that it is to stop publishing its print edition at the end of this year. It seems that publishers are increasingly concerned about the power of ‘new media publishers’ like Google, Apple and, perhaps most of all, Amazon. All of these have the resources to invest in digital sales platforms, and the scale to achieve lower supplier costs. Meanwhile ‘Tablet Wars’ are in full swing with Apple iPad, Amazon Kindle, Barnes and Noble’s Nook, Samsung Galaxy Tab and others including the new Microsoft Surface (and soon, other Windows 8 tablets) fighting it out. Of course, if history were different and everything were electronic and then someone invented glossy paper, printing and binding, with all its advantages of portability and cost, it would no doubt be hailed as a ‘killer app’. In ‘The Digital Age’ publishers are using multiple formats (smartphones, tablets, websites, live events, special editions +++) to engage readers and build their multi-channel media brands. However we should note that Print is a key part of their plans. 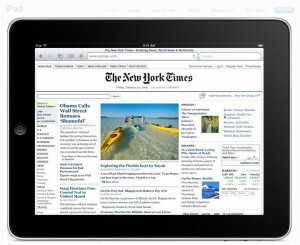 On January 27, 2010, the late Steve Jobs unveiled Apple’s new iPad. 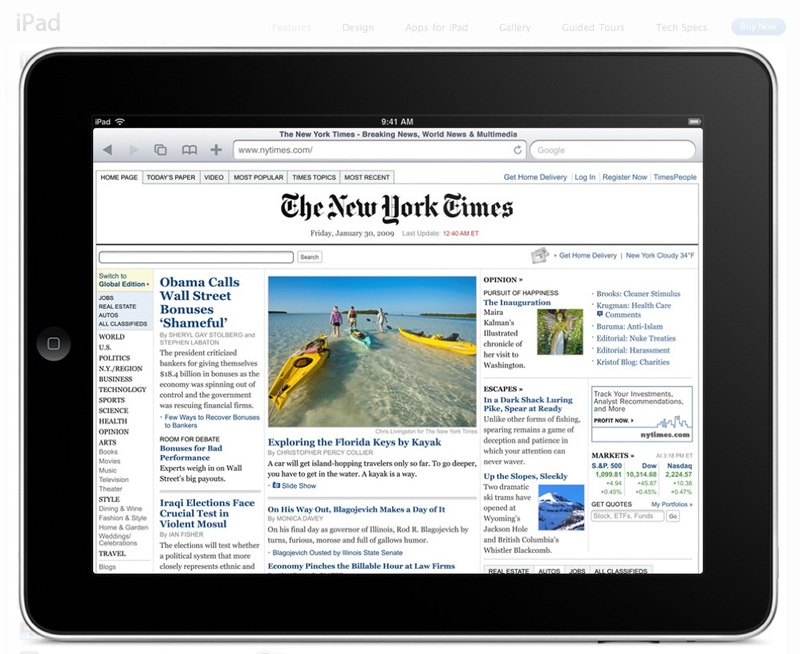 Against the backdrop of a giant image of the New York Times ‘iPad edition’, he enthused about “the best browsing experience you’ve ever had…a whole web page…you can manipulate with your fingers…holding the internet in your hands.”. The implication was clear: here was the future of newspapers and probably also magazines; and it didn’t include print. The launch of iPad – in effect the announcement of a whole new category of ‘tablet’ devices- naturally raised major concerns in the publishing community. Indeed, before the great man had even finished his presentation, certain ‘experts’ were calling it “Book/Newspaper/ Magazine 2.0” and proclaiming the imminent death of periodicals. For some, tablets are the natural successors to magazines, for others they are more a gimmick than a radical game-changer. Others believe the truth lies somewhere in-between – that tablets have their place in the market but they won’t become the whole market any time soon. My own view is that content for the iPad and other tablets should not simply be an electronic facsimile of the print magazine (ie. the PDF that was sent to the printers); that’s just lazy. Certainly the multimedia capabilities of tablets, laptops and desktop computers such as video can add richness to the magazine experience (see Harry Potter’s The Daily Prophet), according to Wikipedia “the most widely-read daily newspaper in Britain’s wizard community. The articles include moving pictures.”. Sometimes it even updates during the course of a day! On the publication of Harry Potter and the Philosopher’s Stone in 1997, this idea seemed, well, magical. But the death of print has indeed been much exaggerated. Crucially, reading magazine content on the iPad is a different experience. The future of magazines is print and web. I believe that, for a long time to come, print will still be at the core of what magazine publishers do and, crucially, will be something they can make money out of. With a strong print title providing an stable anchor for a magazine brand, other avenues can be developed to complement, but not replace the print edition. Nicholas Carr asked in 2008: Is Google making us stupid? He has expounded this thesis further in his excellent new book (sic) The Shallows, in which he argues that the constant multi-tasking demanded of us by today’s communications technology is affecting our neural pathways, negatively impacting our ability to concentrate and turning us into a generation of skittish, shallow thinkers. It makes persuasive reading (once one locks the dog in the kitchen, switches off the TV, mobile and computer and gets down to following the logical and compelling narrative). Carr argues that even adult brains are relatively ‘plastic’, that the internet is a ‘distraction machine’ and that as we learn to cope with multiple competing stimuli, we are ‘unlearning’ how to follow a single linear narrative argument. Maybe we are indeed becoming ‘pancake people’, with our attention spread increasingly thinly over the vast quantity of distracting content and data on the web. It’s true that many of us find it increasingly difficult to read the dense paragraphs of prose as found in books – even on a Kindle. But that doesn’t mean our brains are damaged irrevocably; we can retrain them. Many of us still allocate part of our time to reading books and I’m sure we get something out of that immersive experience, free from ‘distracting’ hyperlinks. The same goes for magazines, with their unique combination of colour images and long-form copy. In this overloaded, multitasking world, the ordered environment of a magazine can have a powerfully beneficial effect on the minds of readers. 1. Don’t duplicate content mindlessly from print to web just because you can. 2. Partial or porous paywalls can work as teasers to sell paid access. 3. Give readers a choice; we’re all different (and sometimes fickle). 4. Don’t give away the content ‘crown jewels’ unless the advertising revenue is massive and sustainable. 5. Don’t let the advertisers drive you into building circulation for its own sake; engagement is more important than eyeballs. 6. Watch the competition closely; maybe they know something. 7. Celebrate print confidently as your flagship medium, without feeling embarrassed that it might be ‘old school’. There’s no doubt that digital platforms can be valid and lucrative additions to the main magazine brand. Consumers have shown themselves to be willing to pay for mobile and tablet magazine apps, whereas they expect their PC news sites to be free. iPads and their competitors may be a radical addition to publishing, but are they a direct replacement for magazines? Not yet, and probably never. Newspaper publishers may well have reason to feel threatened by the digital revolution, but the smartest and most forward-looking magazine publishers see more opportunities than threats. At the end of the day, advertiser support requires reader engagement, which all depends on interesting and relevant content delivered in high quality in whatever way the reader prefers at any particular moment. The print magazine Classic Rock is thriving, with an ABC-certified circulation of over 70,000, of which more than 50,000 sales are sold on newsstands at £5 each. The US edition of tech, design, gadget and futurist magazine Wired was the first to create a dedicated iPad edition, allowing readers to zoom into photos, play music and view animated content around the core magazine articles. Arguably it adds an extra dimension to the static text and pictures. An uplifting read on a digital medium – print lives! A million thanks for posting this inmnifatroo.